THERE was once upon a time an old Queen whose husband had been dead for many years, and she had a beautiful daughter. When the princess grew up she was betrothed to a prince who lived at a great distance. When the time came for her to be married, and she had to journey forth into the distant kingdom, the aged Queen packed up for her many costly vessels of silver and gold, and trinkets also of gold and silver; and cups and jewels, in short, everything which appertained to a royal dowry, for she loved her child with all her heart. She likewise sent her maid in waiting, who was to ride with her, and hand her over to the bridegroom, and each had a horse for the journey, but the horse of the King's daughter was called Falada, and could speak. So when the hour of parting had come, the aged mother went into her bedroom, took a small knife and cut her finger with it until it bled, then she held a white handkerchief to it into which she let three drops of blood fall, gave it to her daughter and said, "Dear child, preserve this carefully, it will be of service to you on your way." So they took a sorrowful leave of each other; the princess put the piece of cloth in her bosom, mounted her horse, and then went away to her bridegroom. After she had ridden for a while she felt a burning thirst, and said to her waiting-maid, "Dismount, and take my cup which thou hast brought with thee for me, and get me some water from the stream, for I should like to drink." "If you are thirsty," said the waiting-maid, "get off your horse yourself, and lie down and drink out of the water, I don't choose to be your servant." So in her great thirst the princess alighted, bent down over the water in the stream and drank, and was not allowed to drink out of the golden cup. Then she said, "Ah, Heaven!" and the three drops of blood answered, "If thy mother knew, her heart would break." But the King's daughter was humble, said nothing, and mounted her horse again. She rode some miles further, but the day was warm, the sun scorched her, and she was thirsty once more, and when they came to a stream of water, she again cried to her waiting-maid, "Dismount, and give me some water in my golden cup," for she had long ago forgotten the girl's ill words. But the waiting-maid said still more haughtily, "If you wish to drink, drink as you can, I don't choose to be your maid." Then in her great thirst the King's daughter alighted, bent over the flowing stream, wept and said, "Ah, Heaven!" and the drops of blood again replied, "If thy mother knew this, her heart would break." And as she was thus drinking and leaning right over the stream, the handkerchief with the three drops of blood fell out of her bosom, and floated away with the water without her observing it, so great was her trouble. The waiting-maid, however, had seen it, and she rejoiced to think that she had now power over the bride, for since the princess had lost the drops of blood, she had become weak and powerless. So now when she wanted to mount her horse again, the one that was called Falada, the waiting-maid said, "Falada is more suitable for me, and my nag will do for thee" and the princess had to be content with that. Then the waiting-maid, with many hard words, bade the princess exchange her royal apparel for her own shabby clothes; and at length she was compelled to swear by the clear sky above her, that she would not say one word of this to any one at the royal court, and if she had not taken this oath she would have been killed on the spot. But Falada saw all this, and observed it well. The waiting-maid now mounted Falada, and the true bride the bad horse, and thus they traveled onwards, until at length they entered the royal palace. There were great rejoicings over her arrival, and the prince sprang forward to meet her, lifted the waiting-maid from her horse, and thought she was his consort. She was conducted upstairs, but the real princess was left standing below. Then the old King looked out of the window and saw her standing in the courtyard, and how dainty and delicate and beautiful she was, and instantly went to the royal apartment, and asked the bride about the girl she had with her who was standing down below in the courtyard, and who she was? "I picked her up on my way for a companion; give the girl something to work at, that she may not stand idle." But the old King had no work for her, and knew of none, so he said, "I have a little boy who tends the geese, she may help him." The boy was called Conrad, and the true bride had to help him to tend the geese. Soon afterwards the false bride said to the young King, "Dearest husband, I beg you to do me a favour." He answered, "I will do so most willingly." "Then send for the knacker, and have the head of the horse on which I rode here cut off, for it vexed me on the way." In reality, she was afraid that the horse might tell how she had behaved to the King's daughter. Then she succeeded in making the King promise that it should be done, and the faithful Falada was to die; this came to the ears of the real princess, and she secretly promised to pay the knacker a piece of gold if he would perform a small service for her. There was a great dark-looking gateway in the town, through which morning and evening she had to pass with the geese: would he be so good as to nail up Falada's head on it, so that she might see him again, more than once. The knacker's man promised to do that, and cut off the head, and nailed it fast beneath the dark gateway. "Alas, young Queen, how ill you fare! Her heart would surely break in two." And bound it up again." And there came such a violent wind that it blew Conrad's hat far away across country, and he was forced to run after it. When he came back she had finished combing her hair and was putting it up again, and he could not get any of it. Then Conrad was angry, and would not speak to her, and thus they watched the geese until the evening, and then they went home. 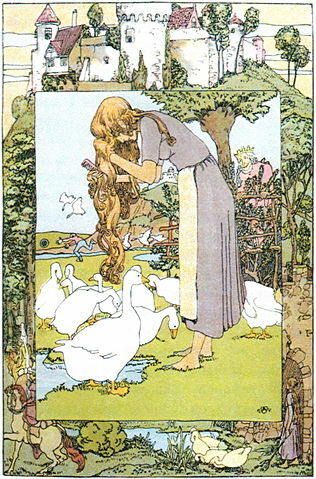 Then the wind blew, and blew his little hat off his head and far away, and Conrad was forced to run after it, and when he came back, her hair had been put up a long time, and he could get none of it, and so they looked after their geese till evening came. "Alas, young Queen how ill you fare! Then came a blast of wind and carried off Conrad's hat, so that he had to run far away, while the maiden quietly went on combing and plaiting her hair, all of which the King observed. Then, quite unseen, he went away, and when the goose-girl came home in the evening, he called her aside, and asked why she did all these things. "I may not tell you that, and I dare not lament my sorrows to any human being, for I have sworn not to do so by the heaven which is above me; if I had not done that, I should have lost my life." He urged her and left her no peace, but he could draw nothing from her. Then said he, "If thou wilt not tell me anything, tell thy sorrows to the iron-stove there," and he went away. Then she crept into the iron-stove, and began to weep and lament, and emptied her whole heart, and said, "Here am I deserted by the whole world, and yet I am a King's daughter, and a false waiting-maid has by force brought me to such a pass that I have been compelled to put off my royal apparel, and she has taken my place with my bridegroom, and I have to perform menial service as a goose-girl. If my mother did but know that, her heart would break." The aged King, however, was standing outside by the pipe of the stove, and was listening to what she said, and heard it. Then he came back again, and bade her come out of the stove. And royal garments were placed on her, and it was marvellous how beautiful she was! The aged King summoned his son, and revealed to him that he had got the false bride who was only a waiting-maid, but that the true one was standing there, as the sometime goose-girl. The young King rejoiced with all his heart when he saw her beauty and youth, and a great feast was made ready to which all the people and all good friends were invited. At the head of the table sat the bridegroom with the King's daughter at one side of him, and the waiting-maid on the other, but the waiting-maid was blinded, and did not recognize the princess in her dazzling array. When they had eaten and drunk, and were merry, the aged King asked the waiting-maid as a riddle, what a person deserved who had behaved in such and such a way to her master, and at the same time related the whole story, and asked what sentence such an one merited? Then the false bride said, "She deserves no better fate than to be stripped entirely naked, and put in a barrel which is studded inside with pointed nails, and two white horses should be harnessed to it, which will drag her along through one street after another, till she is dead." "It is thou," said the aged King, "and thou hast pronounced thine own sentence, and thus shall it be done unto thee." And when the sentence had been carried out, the young King married his true bride, and both of them reigned over their kingdom in peace and happiness. Add The Goose-Girl to your own personal library.